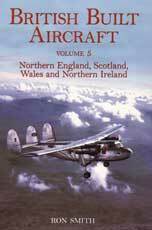 This book features a vast array of companies, both large and small, who have constructed aircraft across Northern England, Scotland, Wales and Northern Ireland. Includes G. & J. Weir, Cunard Steamship Co., Avro, Blackburn, Barnwell Brothers,Scottish Aviation, English Electric and many others. 254 pgs, SB, 6.75 x 9.75, loaded with photos.